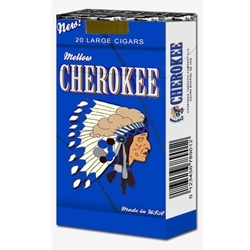 Cherokee Smooth Filtered Cigars are available in Box 100's and packaged 20 cigars per pack, 10 packs to a carton for a total of 200 premium filtered cigars. Cherokee Filtered Cigars are different kind of filtered cigar experience. This brand of filtered cigars feature blended premium Black Cavendish leaf tobacco typically used for pipe smoking. This tobacco makes for a sweet smoke full of delicious flavors with a pleasant aroma, perfect for any time of day or occasion. With an assortment of flavors to choose from, you’ll be sure to find the right flavor for your taste.